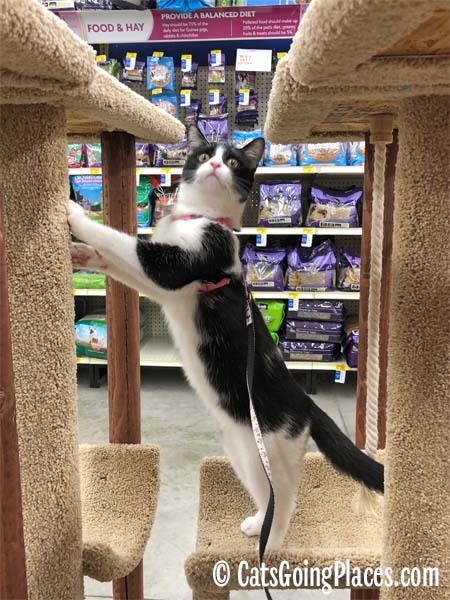 Your local PetSmart is a cat-friendly destination, and it’s a great place to go when you and your cat are first going on outings together. 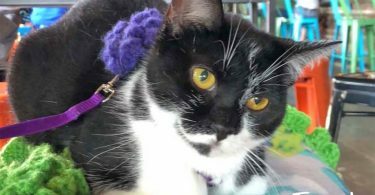 While there are many cat-friendly destinations, PetSmart actively encourages people to bring their pets with them to the store. Many of the stores have on-premises groomers and veterinarians, and they offer things like dog obedience classes. None of those work unless people bring their pets along. Cupcake has always been more comfortable in pet stores like PetSmart than any other stores we visit. I think this is partly due to how the place smells. You may not notice, but it smells like kibble when you walk in the door. What’s not to love about that? 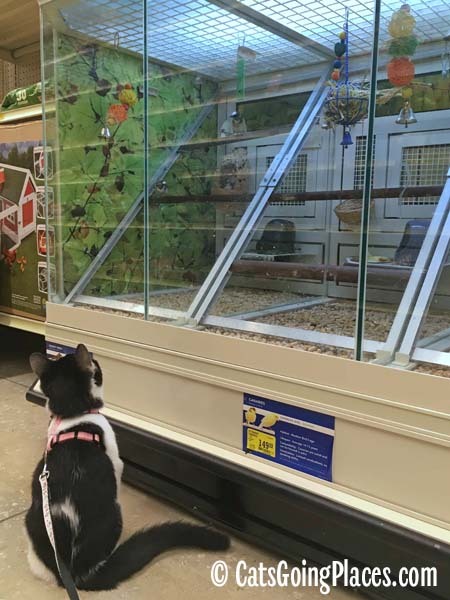 A store like PetSmart has lots of fascinating things for your cat to see. Cupcake is especially fond of watching the birds and pocket pets. She even likes to watch the snakes from her safe side of the glass, when they are active. I believe it is important to watch not just your cat’s reactions to these animals, but their reaction, too. Some of the birds and animals are remarkably unimpressed by a cat peering in at them, while others are visibly bothered by it. 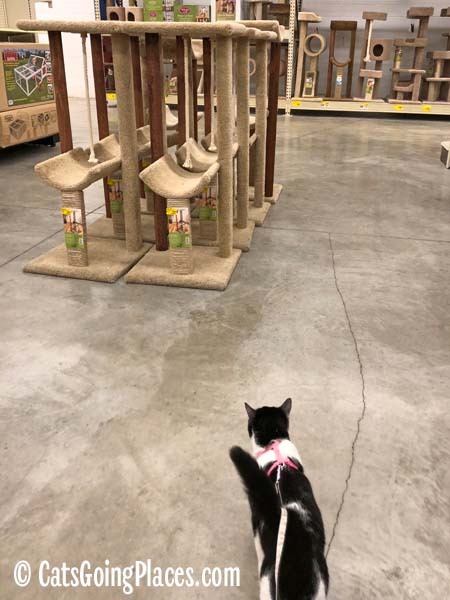 It’s only polite to move on to another spot in the store if your cat is stressing out the animals she is watching. Because PetSmart encourages people to bring their pets, you find well behaved pets and not-so-well-behaved ones, too. 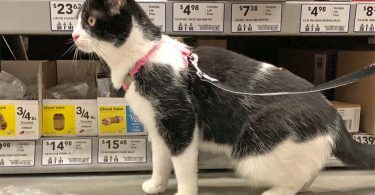 Some of the pets’ humans may not be as knowledgeable about how to ensure their pets behave well toward others in the store. Dogs may be there to attend obedience class because they really do need training. I have even seen dogs wandering off-leash in the store. With so many dogs shopping around the store, it is important to be aware that the end of every aisle is a potential location where you might run into a dog. If your walks on her leash rather than riding in a cart or being carried, don’t let her get too far ahead of you when you are approaching the intersection between aisles. That way you will be on hand to prevent unexpected interactions with dogs. When Cupcake is on the ground, she usually notices dogs in parallel aisles. Her senses are far more sharp than mine. 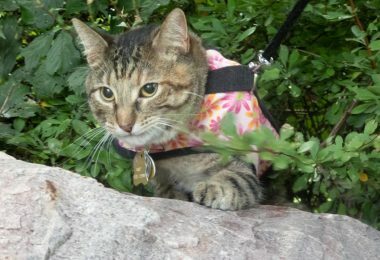 Paying attention to your cat’s reactions can help prevent your being surprised by a dog rounding the corner. PetSmart is an environment full of interesting smells, and dogs are usually too busy checking out the smells at their own level and on the ground to look up. If your cat lets you carry her, this can work to your advantage, since most dogs won’t notice your cat is there. If you want to avoid having so many dogs in the store when you visit, you can try going during the week. 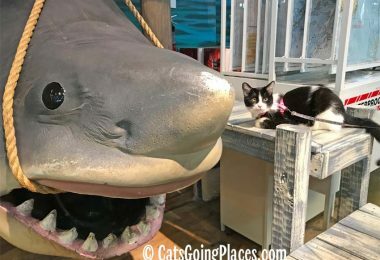 It tends to be less crowded with visiting pets in the store then, since many people have to work those days and don’t have time to also take their pets out for a little shopping. Have a great trip with your cat to your local PetSmart. Your cat will also probably be one of the few the employees see, so they will be delighted with your visit. We don’t go to our nearest PetSmart that often because the other big store has two locations that are closer. But I enjoy visiting it. 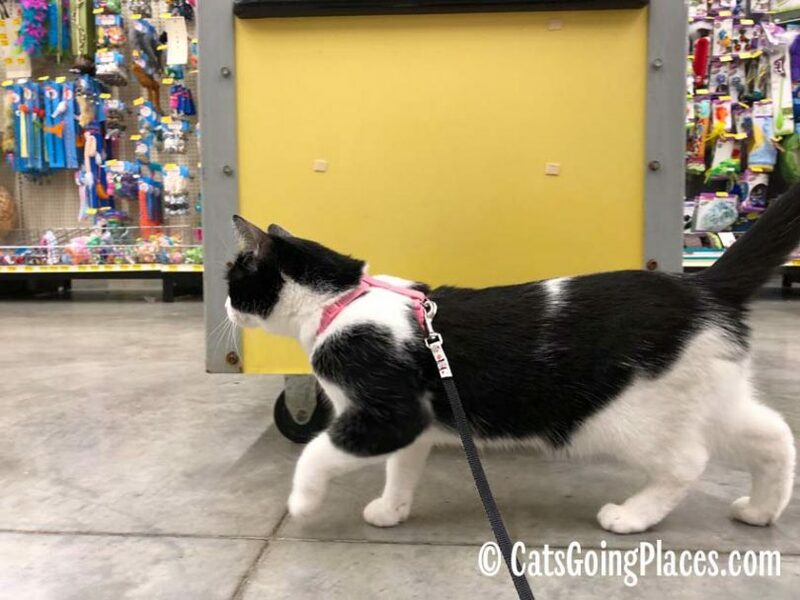 I’m often on my leash and not in the shopping cart, and my human is always looking around corners to keep me safe! I don’t mind dogs, so I don’t react to them and need my human to look out for me and keep me safe.